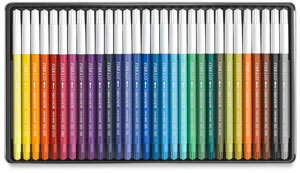 Designed for budding artists as well as professionals in the fields of design, architecture, and every artistic pursuit, these Swiss-made, fiber-tipped drawing pens are ideal for sketching, drawing, and coloring. Available individually and in a variety of sets, Caran d'Ache Fibralo Markers contain watersoluble ink in a range of luminous, transparent shades. The ink is vegetable-based and non-allergenic. It won't bleed through paper, and washes out of most fabrics. Even if the cap is left off, the ink retains its properties for up to seven days without drying out. 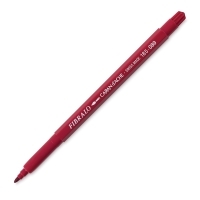 Fibralo Markers have ventilated safety caps, and hexagonal barrels that are easy to hold. The long-lasting, medium-point fiber tips create clean, sharp lines and retain their shape over time. 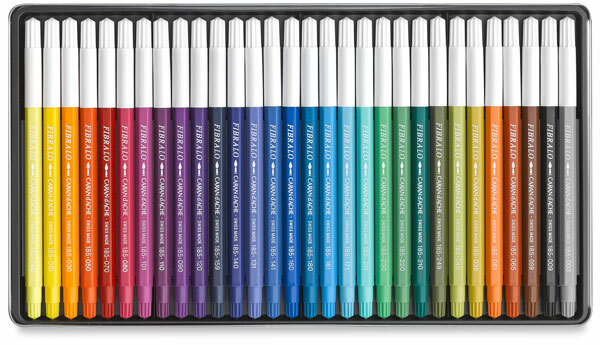 The durability of these markers assures up to three years of use. Fibralo Marker sets are packaged in reusable metal tins. Set of 10 — This set includes the colors Black, Yellow, Orange, Brown, Scarlet, Purple, Cobalt Blue, Light Blue, Emerald Green, and Yellow Green. Set of 15 — This set includes the colors Black, Yellow, Orange, Brown, Scarlet, Purple, Cobalt Blue, Light Blue, Emerald Green, Yellow Green, Light Grey, Ochre, Salmon, Periwinkle, and Ultramarine. Set of 24 — This set includes the colors Black, Yellow, Orange, Brown, Scarlet, Purple, Cobalt Blue, Light Blue, Emerald Green, Yellow Green, Light Grey, Ochre, Salmon, Periwinkle, Ultramarine, Flame Red, Russet, Carmine, Violet, Prussian Blue, Malachite Green, Jade Green, Lemon Yellow, and Light Olive. Set of 30 — This set includes the colors Black, Yellow, Orange, Brown, Scarlet, Purple, Cobalt Blue, Light Blue, Emerald Green, Yellow Green, Light Grey, Ochre, Salmon, Periwinkle, Ultramarine, Flame Red, Russet, Carmine, Violet, Prussian Blue, Malachite Green, Jade Green, Lemon Yellow, Light Olive, Light Purple Violet, Lilac, Sky Blue, Turquoise, Grass Green, and Olive.